I had not been on a bicycle since the accident that happened almost a year ago. The doctor had given me the “all clear” to go back to my regular activities a while back, but I had not done it even though I had decided a long time ago that there was no way other than to get back on the bicycle. 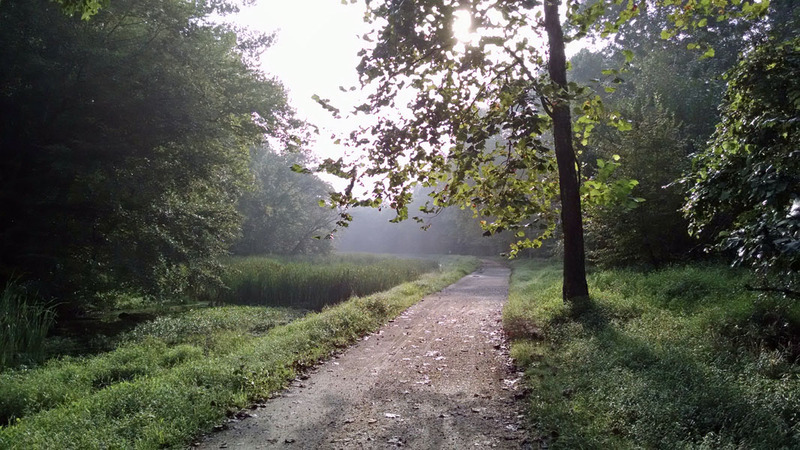 The truth was that I was also missing all the training rides that I had being doing in the years past – on various sections of the C&O Canal towpath, on the Capital Crescent Trail into Bethesda and Silver Spring; on the Custis, the W&OD, the Mt. Vernon and the Four Mile Run trails in Virginia; and even the ride up Sugarloaf Mountain. I knew these trails somewhat well by now, and I could even picture some of the specific experiences and challenges that one came across along the way, whether it was the stop at Fletchers Cove to use the facilities and get a drink of water, crossing the Potomac on the Key bridge, or riding along the river on the Mt. Vernon trail past Gravelly Point and National Airport, or the challenge of one of the slopes on the Custis trail or Sugarloaf mountain. I needed to do it. But time passed and it did not happen until now. You could say that there was a bit of apprehension on my part, not because of the fear of riding a bike per se, but because of a fear of falling off the bike. It was specifically about the possibility of falling on my separated shoulder once again. I had a mental picture of how severe the damage could be to a clavicle that was already floating around. I did actually look for specific protection that could be worn it this regard, but the only solution out there would have made me look and feel like a gladiator with plastic armor-plating on a bicycle. I could not picture that! But there were other real excuses. We were busy with a wedding and with guests who were visiting until now. Before I knew it, we were half way through the year. I finally made the move Wednesday morning. I checked out my biking gear the first time in many months – the shorts, the tops and the gloves. Things were where I expected them to be. I checked out the bike, still covered with dirt from last year, reinflated the tires, grabbed my helmet, and after a test ride around the cul dec sac, loaded it into the back of the car. Finally at Pennyfield Lock. I decided to ride a distance of about 16+ miles (one way) to Fletchers Cove this day. I had forgotten how cool it could be under the trees even on a July morning in the middle of summer as you rode against the wind. I had forgotten the rhythmic sound of the crunching of the tires against the gravel of the trail as one rode on the dirt. I had forgotten the easy and peaceful nature of an early morning ride. There was a feeling of serenity, and the mind could wander once again. I took it easy. This is the way I usually start a ride, especially after a break from when I have been challenging myself. But then the Adrenalin kicks in and, before you know it, your legs are moving to a steady beat and the pace is increasing to another level. And it is all so effortless at this point. You are enjoying the ride. I can still sense some fear in me, a fear of falling off the bike if I got too close to the edge of the trail, but it is no more about the shoulder. I know I am over it, and it has happened quickly. The other general fear of wandering across the trail and falling off into the woods or the water will disappear with time, just like it used to in the past. It is a defense mechanism of the brain that I appreciate. Life along the canal has not changed. I have to stop for pictures along the way. There are people around on this cool summer morning, especially later in the morning. I re-familiarize myself with the practice of passing people who are on foot on the trail. There are many such people. Recent rains also seem to have done severe damage to the trail. I take a couple of detours off the trail along the way. The ride back to Pennyfield Lock is when the muscles in my thighs begin to feel it. It is a familiar feeling, but it is not a feeling that you tend to remember the details of once the ride is complete and those sore muscles have recovered. I ride steadily, without a sense of rush, but by now I am also in the groove once again, and I have to make the conscious effort to slow down, and perhaps even stop once in a while to take a picture or two. This is all familiar territory for me. The ride ended successfully. I am going to try my best to make sure this was not just a one-time effort, a flash in the pan if you will. I need to do more rides for my sense of balance and sanity. Perhaps longer group rides are in the cards once again starting next year. The scene unfolded during our Sunday morning walk along the C&O Canal. We were headed back from Swains Lock to Pennyfield Lock along the towpath (the trail). The canal, which happens to have water flowing in it in these parts, was to our right, and to our left was vegetation and a somewhat sharp drop off to the Potomac river. The only people on the trail in front of us were a middle aged couple who walking towards us from the distance. We heard a commotion behind us. After initially ignoring it, I turned back to see that there were two deer running on the towpath in our direction, being followed by two bicyclists. One of the deer was bigger than then other, probably a parent. Even though the deer had seen us, they keep coming, veering neither left or right. They were scared by the cyclists, and also of what lay on both sides of the trail. We turned to face the deer. I feared a possible collision and I moved to protect my broken ribs. The deer finally stopped not too far from us. The bigger one then jumped into the trees and bushes on its left, towards the river, and the young one followed. The bicyclists went by. As the people coming towards us got closer, the bigger deer crashed out of the bushes beside the river and ran across the trail into the canal. It swam across to the other side of the canal and climbed up the hill beside the canal. You could barely see it behind the trees. There was no sign of the smaller deer, but we knew that it was still on the other side of the trail, separated from the deer that was probably its parent. As the folks approaching us went by, the little deer jumped out of the bushes beside the river in front of them. It saw the people approaching. It took off in the opposite direction along the trail, heading back towards where it had originally come from, and away from the other deer. The folks who are now walking behind the sprinting deer are pantomiming and trying signal to the deer to cross the canal to be with the other one. The deer is in a panic, neither can it understand human communications. Go back and get your young one, we ourselves say to the bigger deer who is on the other side of the canal. Of course, we are not speaking the deer’s language. The places that we frequent during the weekends allow us to experience things that may be considered out of the ordinary, things that we do not see during the normal course of the day in our usual surroundings. It may simply be that the turtles are hanging out on the logs, or the great blue heron are fishing, or that the wren is singing on a tree as you pass by. You just need to keep your senses open and a different world opens up to you. But our experience last Sunday was unique even by those standards. I made it a point to return to the C&O canal for the first time today after the accident in Canada. The pictures below are perhaps old in the sense that I have posted similar pictures before, but they also represent something new in my recovery process. I am able to walk decent distances in the park, and I am also able to take pictures! Assuming no setbacks, I intend to slowly but surely try to get back to the stuff I enjoy doing outdoors. This trip was to Pennyfield Lock. In an expanded spirit of the theme, I have picked some pictures that may fit the theme in more ways than one. These are all old pictures. The situations that some of them represent can never be repeated. Some of the others took place just because I happened to be in the right place at the right time, and this happened by chance, and it may never happen again. They all have to do with memories. The pictures below were taken in 2005 and 2006 respectively. One had to be there at the right time of the year, at the right moment in time of the day, and on a day with the right conditions, to be able to see these. The conditions along the C&O canal where these pictures were taken have also changed since the time I took them, so that these conditions may never be duplicated. It was an evanescent moment in time that one could have said was a figment of my imagination if I did not have the pictures to show. The following picture is from 2009. It was humid on that particular morning, and this caused the mist to rise from the railing on the bridge at Broad Run Trunk on the towpath. I had never seen this before, and perhaps I will never see it again. I just happened to be there at the right time. And then there is this series of pictures taken in 2009 of the train that appears out of the mist on a cool morning and then quickly vanishes from sight, as if it had never been there in the first place. Nobody else was there to see it. It was like that tree falling in the woods. It was an evanescent experience that is only remembered today because of the pictures. The following picture is from 2005. The broken-down building below used to be the Pennyfield Inn, and it used to be next to Pennyfield Lock. The building was built in 1879 and was finally demolished in 2009. It is now replaced with an open space that feels like it has always been there. (The building actually has an historical context in that President Grover Cleveland used to stay here during his fishing expeditions to this area.) The Pennyfield Inn is now just a memory. It existed for only a fleeting moment in time in the grand scale of history, and now has disappeared. This picture from 2005 illustrates the evanescence of the life experience. One of the kids in this picture has just finished high school, the second is in college, and we just celebrated the college graduation of the third. The circumstances of the old picture below are now but a distant memory. Here are other submissions to the challenge.